En route from Massachusetts to Delaware – the Blue Hen State – and where I grew up, I read aloud to hubby, Gail Damerow’s excellent book, “A guide to raising chickens.” I got it from the library. Note to self: Buy a copy on http://www.half.com/, an excellent source for used books. Gail covers everything – feed, housing, disease, bird personality, economics, record keeping, egg production, butchering, molting. I’m learning a new vocabulary. 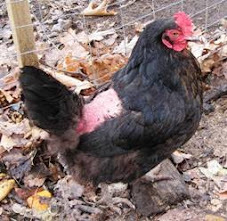 Brood – a hen that covers eggs to warm and hatch them. Some hens lack this maternal instinct. Too much reading and I feel overwhelmed by my lack of knowledge. I grew up in a city. Our backyard had a basketball hoop, volleyball net, swing set and playhouse. We grew a few tomatoes for diversion, not sustenance. The grape arbor attracted bees and looked cool. A crab apple tree came down to make room for the basketball hoop. Food came from the A & P and occasional farm stand in summer. Once a year, we picked apples at an orchard about a half-hour away in the country. We had no pets. Nine children occupied all of my parents resources. The one thing we had in our backyard that chickens like was DUST where our constant activity had worn down the grass. The only place I have ever seen baby chicks hatch was at the Museum of Science in Boston, with my children. That's ironic. Chickens in a museum. That's how far removed we are from our agrarian roots. I'm immigrating to a foreign country where I have to learn the language, eating habits and culture of something for which I have zero references or knowledge, other than quiche, scrambled eggs and meringue. Some of the sayings are familiar and I’m finding out their literal meanings – pecking order, don’t get your hackles up, nesting, run around like a chicken with your head cut off, chicken out, chicken feed. In the advent preparing for my new birds, it’s like a pregnancy or the time before Christmas. But it feels right. Merry Chicken Advent.